Castle Huntly is Scotland's only open prison accommodating a capacity of 285 low supervision adult male offenders from any Local Authority area. 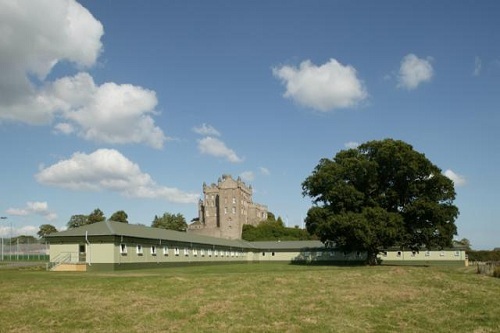 Following a robust risk management process and a period in closed conditions offenders can progress to Castle Huntly where the emphasis is on careful preparation for release. Activity focuses on enhanced personal responsibility, job readiness and positive citizenship with the aim of reducing the risk of re-offending and contributing to safer communities. It is perhaps hardly surprising that Castle Huntly ranks amongst Scotland's lesser known strongholds, despite its great antiquity, when one considers the use to which it has been put since the Second World War. A girl's probationary school, a Borstal for boys, a Young Offenders Institution and currently an Open Prison for adults! Inevitably, accessibility to the general public has been severely restricted and it seldom features in any guidebooks for obvious reasons. The exact date of construction is uncertain but, in 1452, the first Baron Gray of Fowlis obtained a licence from James II permitting the building of a fortalice on any part of his land and it is generally agreed that Castle Huntly was completed in the second half of the 15th Century. The earliest surviving record, in the "Register of the Great Seal", records a charter granted by James IV, dated at St. Andrews 7th January, 1508, in which the monarch concedes to Andrew, 3rd Baron Gray, then Justiciary of Scotland "the land and barony of Langforgund, with the dependencies, tenants and tenandries-viz, the lands of Langforgund, Huntlie with the tower and fortalice…"
Built by the 1st Lord Gray of Fowlis, Castle Huntly stands on an outcrop of volcanic rock just south from the village of Longforgan. Stone from Kingoodie Quarry, on the banks of the River Tay was used in its construction. Being exceptionally hard stone, it was built to work with but it was extremely durable as evidenced by the condition of the castle building, now nearly 560 years old. Over the next 200 years there were a number of additions to the castle. In 1660, an additional storey was added by Earl Patrick of Strathmore, in 1776, a major reconstruction was carried out by the Paterson family, when the building was given a new roof, a central tower or "lantern" was added and two wings, each of two storeys, with an entrance hall in between, were erected so forming what is now seen as the front of the castle. During the war years, the castle was used as a girl's probation school before being purchased in 1946 by the Scottish Home and Health Department for use as a borstal and, today, it still belongs to the Scottish Prison Service. Family Contact Officer 01382 319 425 (The Family Contact Officer is not available at all times, if you contact this number and they are not present, please ask to speak with the Duty First Line Manager). · Taking the road to the right to access the prison when you reach the old stone gates. · Travelling from the east coast through Perth (A90), approximately 17 miles. The Prison can be accessed from a number of train stations, Perth (16.1 Miles), Dundee (7 Miles) and Invergowrie(4 Miles) . Contact Scotrail on http://admin.scotrail.co.uk/enquiries for further information. From the station you can access to public transport to reach the establishment. There are public parking facilities, which include disabled spaces, for visitors to Castle Huntly. On entering the establishment the visitors’ parking is on your left outside the links centre. There are a number of disabled parking spaces outside the links centre. If further assistance is required, phone in advance to inform staff of your individual requirements and this can be managed on your behalf. Offenders are responsibly for booking their own visits at Castle Huntly and the have responsibility of informing their visitors of the timing. Offenders are entitled to not less than 2 hours in any period of 28 consecutive days. Evening visits last 1.5 hours, and weekend visits lasting 2 hours with a maximum of 3 adults; this does not include children. Agents visits can be arranged on 01382 319 329. All agents are required to give 24hrs notice of any visits or amendments to visit bookings. You are required to carry your Law Society of Scotland ID card. Evening sessions are available on the day for professional agents that have been unable to attend the day time session. Below is a list of idenification requirements and the times of visits session, and what you can expect coming to the prison.To gain access to the prison for the purpose of a visit, you must have two forms of identification, one of which must be photographic ID. Entry to the prison will not be permitted without acceptable identification. On arrival at the barrier you should press the intercom and advise the staff member you are there for a visit. Once through, bear to the left and park in the visitor spaces, 10 yards from the barrier. On your right hand side you will see the Link Centre – this is where the visits take place. Everyone attending the prison for a visit must book in at the Links Centre, at least 10 minutes before the visit session starts. This is to allow sufficient time to process your details prior to the visit. The centre staff will log you in on the system and it’s important this is done first; you can then use the facilities and relax until your visit session starts. If you are early please go into the Link Centre where there are facilities to wait in comfort. You will require your identification at this stage. You will be allowed to take in a purse or wallet. If you have a baby with you, you can take essentials such as a change of nappy, baby wipes and baby bottle with milk – baby food is permitted. The baby items must be left on the links centre desk in the visit room, but you can access them when you need to. On entering the main door of the Link Centre, there is a front desk with prison officers staffing it. You will be required to present your identification to the staff. The staff will then advise you were you can wait for the visit to commence. There will be staff in this area to help and offer guidance. From November 2014 we aim to have a Family Contact Officer (FCO) available for advice and support also. In the waiting area you can deposit money for offenders PPC; at the desk the officers will give you a receipt for this. Visitors may be subject to a rub down search. At times, there may be the SPS Dog Unit operating at the visits – it’s nothing to worry about and you will be given instructions by the staff. If you have any concerns at all – please talk to a member of staff. Visitors can choose where they would like to sit, and will be made aware 5 minutes prior to the end of the session. Community Access (Enhanced Regime) - Whilst at open estate, individuals who are on full community access and have been resident for 12 months or over, have the opportunity to apply for inclusion on the Enhanced Regime Process. An extended licence whilst on placement, between the hours of 16:00 & 20:00 staying within a 20 mile radius of the establishment with immediate family, partner, home leave addressee or friend. There will be an FCO available (from November 2014) for anyone wishing to speak to them throughout the evening visits. The listener group of offenders operate a tea and coffee making facility, while there are vending machines available for snacks. At the weekend there are sandwiches and fruit provided from the canteen. There are toilet facilities, including disabled toilets and baby changing facilities available as well as a children’s play area, which again is unsupervised and parents responsibilities. Offenders will complete the relevant form with the date and time property will be handed in. It is the offender's responsibility to inform their visitors what they can hand in and when. Visitors handing in property require photographic identification and evidence of their home address, as described for visiting identification. Staff will issue a receipt for the property. You can post in property for offenders, but the individual must have completed the pro-forma prior to the items arriving. Mark the parcel for the offender’s attention. To ensure the parcel arrives safely, you can send it recorded delivery (cost incurred at the post office). You can post money in to an offender for their PPC, however we would strongly recommend either recording/special delivery (costs incurred at the post office) when posting cash or you can post a cheque or postal order (again there is a cost incurred at the post office for the order) in. Both of these should be made payable to the Scottish Prison Service, but please note the offenders details on the back of the order or cheque.